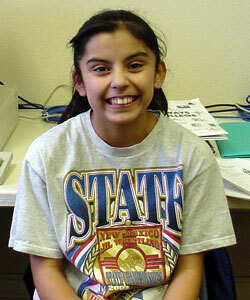 I am 13 years old I was born in Espanola, New Mexico. I have one sister and I live with both my parents. I love to do sports especialy wrestling. I also do other sports such as basketball, crosscountry,a nd vollyball. I like school somtimes, but I get by I do my homework. I like to eat, watch T.V, listen to music ,and go out with my friends. I like to shop till I drop. I love to draw. I am also in Mariachi ,and advanced band. I like the Open Studio Youth Project. I have learned a lot and it is a fun project thanks to Nancy Montano for all her help in the project. Thanks to La Plaza Telecommunity.